Cake: Made by me and inspired by Katherine Sabbath's amazing cakes. I made a lemon-coconut cake (my go-to cake - the flavour is amazing), and a sour cream chocolate mud cake (minus the coffee) which I cut in half to make two layers. I used this buttercream icing recipe to add between the layers, and cover the cake. Then I made a chocolate ganache (cream, Callebaut dark chocolate and butter), which I cooled slightly and then dripped over the edges of the cake, and then filled in the top. I had then literally took a handful of caramel popcorn, Maltesers, some fairy floss and whatever chocolate biscuits I had and piled them on top. I had two lollipops in the lolly jar left-over from previous parties, two candy canes, and two sweet cookies made by One Sweet Chick. I made the chocolate bark (melted white Callebaut chocolate, spread on a baking sheet, added sprinkles and set in the fridge). I add a few sprinkles and let a few bits and pieces fall over the edge, and there you have a Crazy Cake exploding in colour and joy. 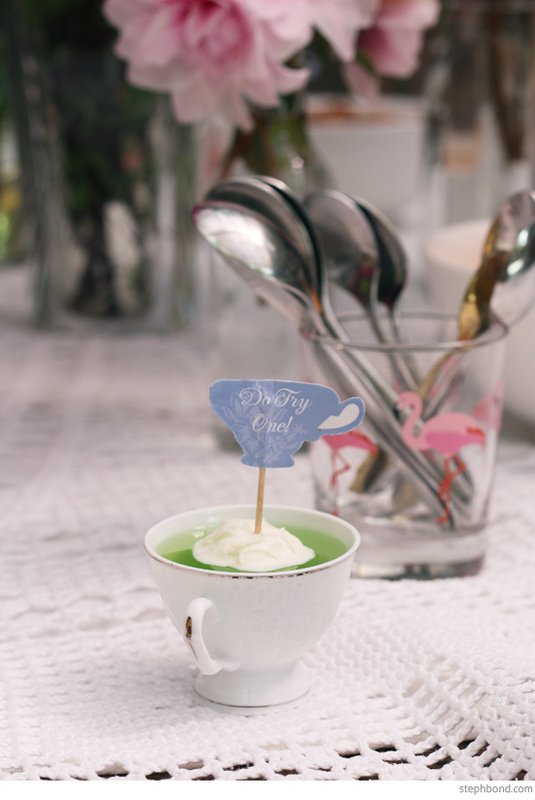 Party food: Chips, individual lime jelly tea cups topped with whipped cream and Truly Scrumptious mini teacup food flags (you can find them here), cinnamon sugar doughnuts (game), chocolate banana milkshakes with DIY toppings and cups of water. 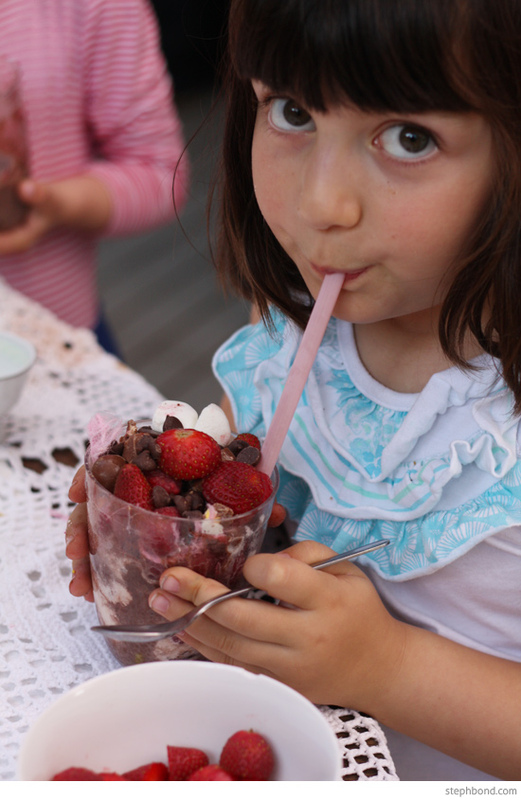 The girls and I made up small bowls of crushed up Maltesers, Oreos, Mint Patties, popping candy chocolate, raspberries, cut strawberries, persian fairy floss, cut marshmallows, chocolate chips, and sprinkles. I whizzed up the milkshakes in a blender (milk, bananas, cocoa powder, honey), and topped with whipped cream. 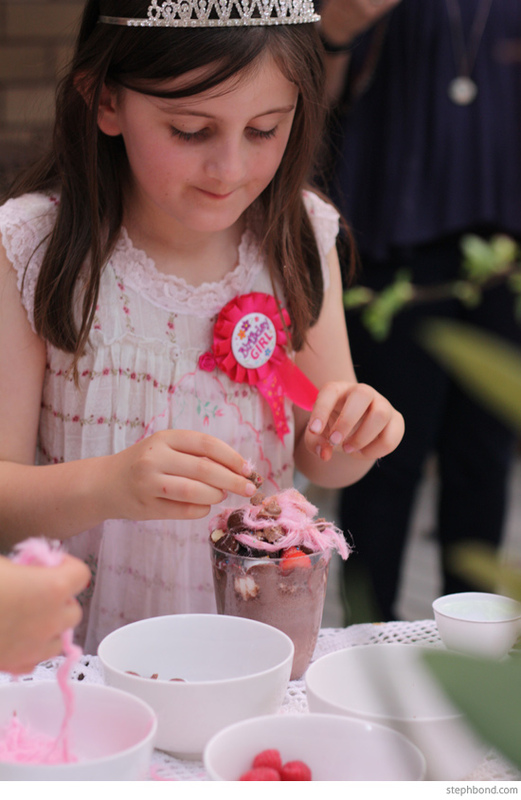 The kids then added their own toppings, which they loved! 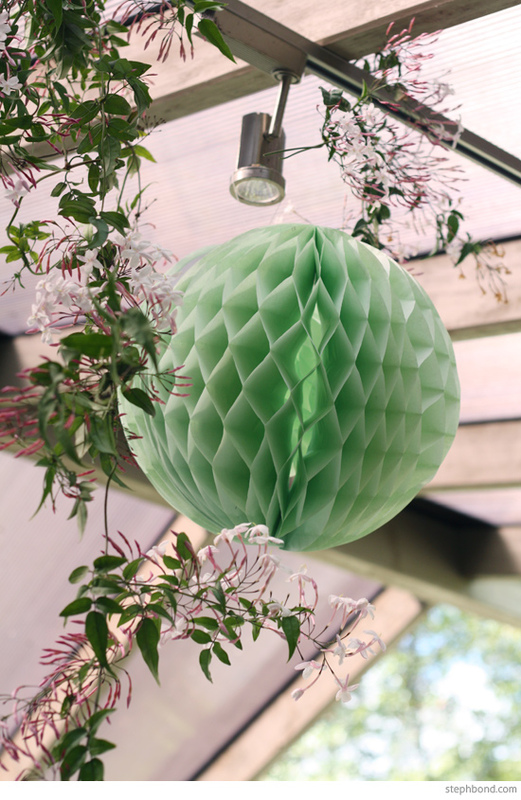 Decorations: What I loved most about this party was that it is really inexpensive to put together. 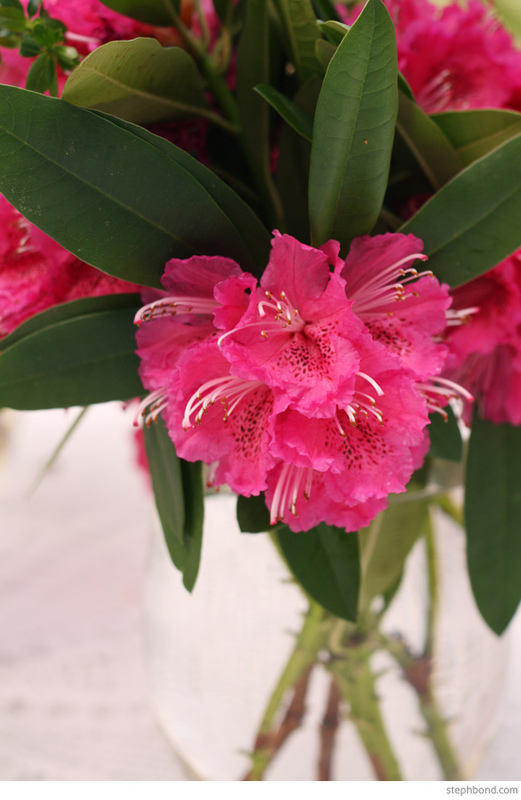 I literally went through my party decorations stash and re-used some honeycomb balls, spread a doily table cloth on the table (that we use for all our parties), popped flowers cut from the garden in vases and glass bottles, and hung strings of jasmine from the ceiling. It literally took fifteen minutes. Birthday Girl Wears: Handmade dress gifted from Nanna, crown gifted from her Aunty in Seattle. 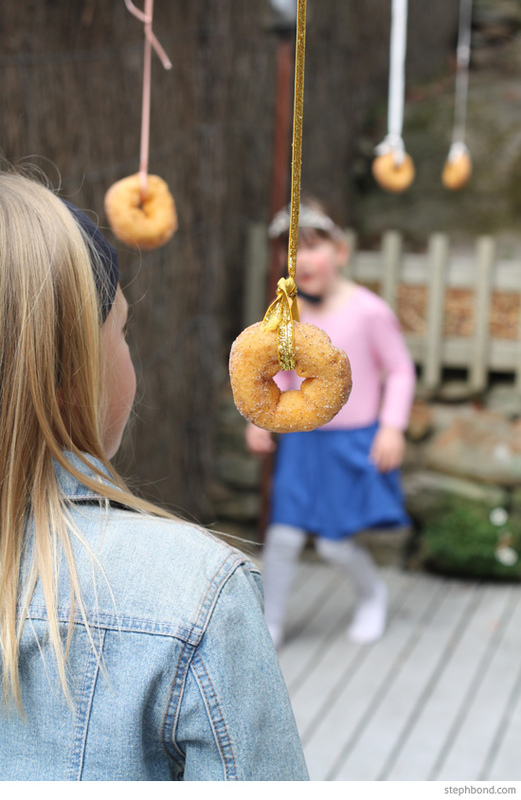 Games/activities: My husband organised the activities including a cool music playlist, a fun doughnut eating competition (no hands! 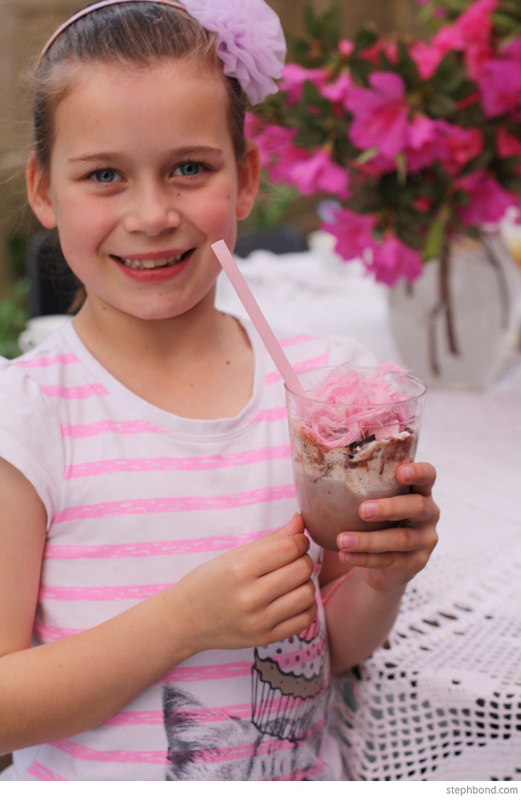 ), balloon around the ankle popping competition, musical statues, and DIY milkshake toppings. We didn't worry about prizes. 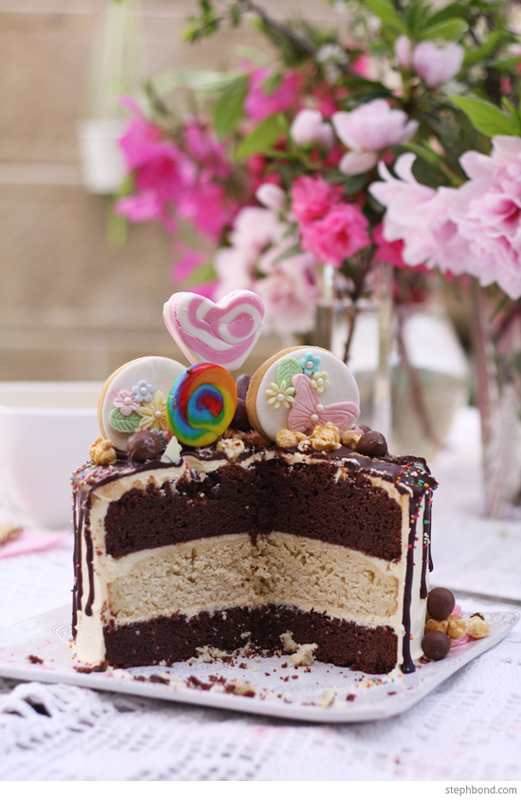 Tips: I find a cake palette knife is essential to get a smooth buttercream frosting on the cake. My frosting was also a little soft, so I popped the cake in the fridge between each step for the frosting to harden a little. 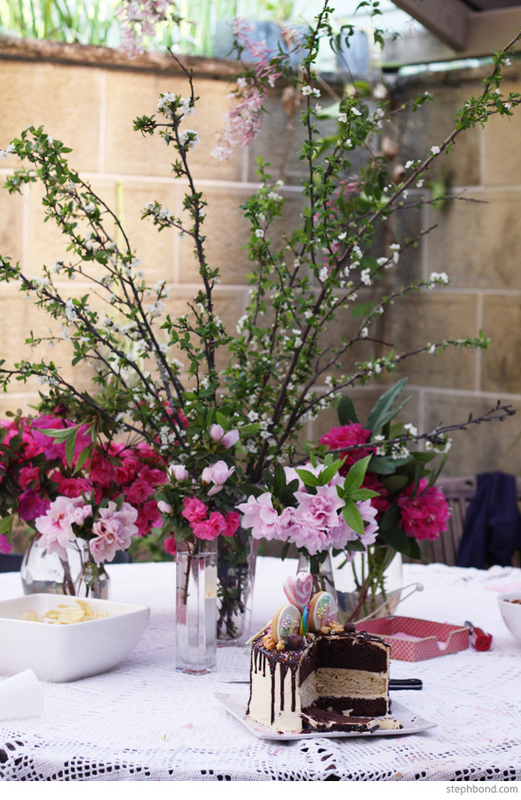 Having fresh flowers meant I didn't have to spend time on decorating; and cutting back on party food meant that the kids actually ate the cake. 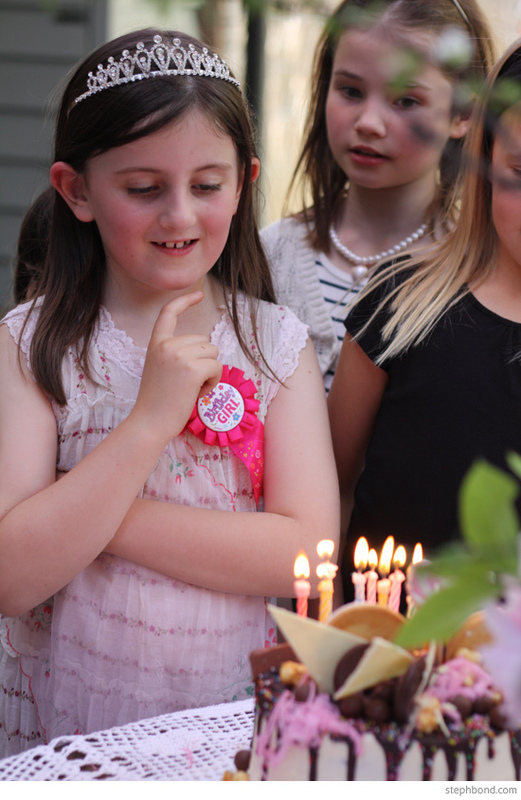 Something special: The look on my daughter's face when she saw the cake will stay with me for a long time. I hope that she is inspired to embrace her creativity throughout her life. 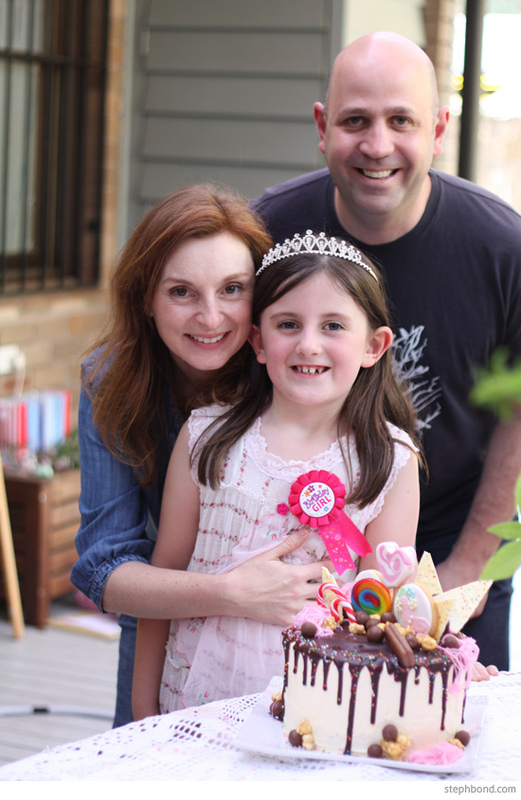 You can find more great Real Australian Kids Parties and ideas here on this page. And here are all of my parties that I have created for my family. 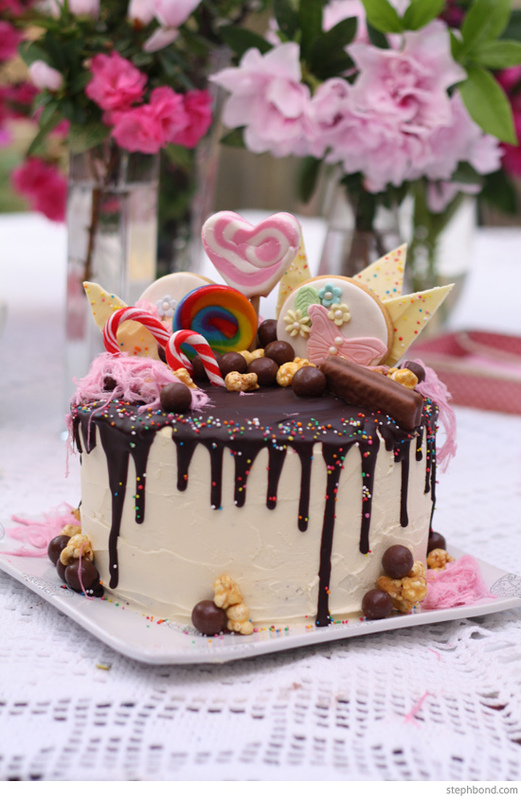 I really encourage you to give the Katherine Sabbath-style Crazy Cake a go - it's a really fun experience and not too difficult to achieve! You did such a great job on that cake! Amazing! I am inspired. I know two other little girls who would absolutely LOVE this cake and birthday party. Well done Steph!! What a lovely party! That cake is beautiful and I'm so impressed with how minimal yet inspiring the whole party was. Such an inspiration!